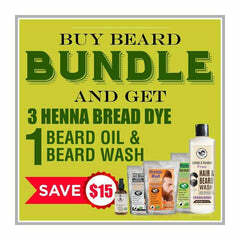 Vamp up your facial hair, and look, with our light brown henna beard dye, free of chemicals or additives. This vegan formula helps you get an attractive sandy brown color and leaves with no side effects or bad reactions. Our mixture includes raw ingredients, in their most natural form, that help bring you a high-quality dye with henna and indigo powder as the color base. Then, we add in herbs that will further enhance the dyeing process, as well as the end result and look of the facial hair. Prepared in small batches, our product mixtures are guaranteed fresh and go through high levels of quality control. We package our light brown henna beard dyes in double insulated bags so that level of freshness stays put, even after you open the bags. This henna beard dye is most effective on light tones and the dye may not show up on dark tones. Henna works as the base of the dye, giving it natural tones of red. The plant derived ingredient also helps in providing the facial hair with some conditioning action. Indigo powder is important to help create such a lovely shade of light brown. This blue hued powder, which is made from a plant, works with the henna to create different shades of browns and blacks. To ensure that your color looks bright and adheres to the facial hair, we add in amla powder, which comes from the Indian gooseberry. Help improve the overall look of look of the end result with false daisy. This herb is important because it adds immense shine and gloss to the facial hair. Rose mallow is added to the product so that your facial hair looks healthy and fresh. This ingredient mildly cleanses the facial hair so that it looks fresh. Get a sleek and smooth look for your facial hair with neem added into our product. These leaves provide intense conditioning to the hair. I always used to have skin allergies after using chemical beard dyes then fortunately I found this natural light brown beard dye from the henna guys which perfectly matches with my original beard color. Now I don’t have to worry about my grey hair! Wow! these all beard dye products are amazing. One can dye his beard in any color using these henna dyes. It is natural and doesn’t harm my skin! I’m satisfied with its results and will continue using these beard dyes. Loved it. It is so easy to use and has very good quality. Color is really bright and has given my beard a natural shine. I don’t have to use those harmful chemical products now. It gives perfect results. Great! I've never used any beard dye and not to consider it even. But last week my friend asked me to give it a try and his sparkling beard tempted me to do so. Now I’m loving my new color which has given me an entire new look. This natural light brown henna dye by Henna Guys in remarkable. I used it on my hair and beard and it gave me a new and fresh look with excellent dark brown color without causing any harm.